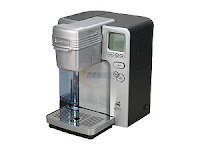 This weekend Newegg is offering this Cuisinart SS-700 Keurig K-Cups Chrome Single Serve Brewing System for just $129. That's 65% OFF the retail price and includes FREE shipping. The next best price I could find online was $45 more. So I absolutely hate making coffee. It's one of those things I can't really explain, because it doesn't take long yet it annoys me. This makes it simple - just plop a K-cup in the thing and press 'on', and in a minute I have a sweet-brewed drink. Those Keurig K-Cups have over two hundred varieties of pre-measured, premium brand coffee and tea. It also accentuates the kitchen. Peolpe will think you're extra fancy with that sitting on the counter. Click here to view this and other weekend deals at Newegg.com (it's about three lines down on the page). Be sure to add promo code EMCYTZT3525 at checkout to get the $129 price.